It could not have been a more perfect weather day for the 2016 United States Pro Kart Series season finale. Rain threatened the event Saturday, coming through the Wampum, PA area during the evening hours, leaving the Pittsburgh International Race Complex facility soaked by the time teams arrived Sunday morning. The track dried out by the time qualifying began with the adjusted Prefinal-Final format set for the eighth and final round to decide the eight class champions. Throughout the weekend, everyone has been keeping their thoughts with Jamie Sieracki of Franklin Motorsports. Friday afternoon, Sieracki fainted while walking out of the team trailer. The Merlin Nation members were right there to aid him, and get him alert to bring to a nearby medical center. After a full day trying to recover in the hotel room, he and father George elected to head back toward the Milwaukee area for further treatment from his personal doctors. Sieracki is among the most respected individuals in the sport, and we ask that you keep him in your thoughts over the next few days. Entering Sunday, Brandon Lemke had clinched the championship in the Franklin Motorsports IAME Pro division. With four wins on the year, the Merlin pilot was not ready to sit back and watch anyone else take the glory on Championship Sunday. 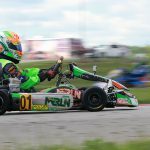 Jacob Donald (FA Kart) clinched the top spot in qualifying before getting shuffled back to fourth in the Prefinal behind Round Seven winner Braden Eves (Kosmic), Lemke and provisional Saturday winner Austin Garrison (CompKart). Lemke was the one getting shuffled come the main event start, dropping to fifth on the opening lap as Eves set the early pace. He led the first eight laps before a mechanical issue put him into the grass, handing over the lead to Donald. It appeared that Donald was on pace to secure his first series win since April 2015, until Lemke placed himself into second and continued charging toward the leader. In the last few laps, the two swapped the lead before Lemke secured the position on the final lap, heading into turn one. The new champ defended the top position around the final circuit, holding off Donald at the checkered flag for his fifth victory in 2016. Brandon Jarsocrak (Praga) recorded his fourth third-place finish on the year, placing ahead of Ryan Norberg (Tony Kart) and Garrison. With only five drivers making the final round, the Comet Kart Sales Yamaha Pro produced one of the best races of the year. Top qualifier Zach Holden (Tony Kart) and Prefinal winner Brandon Lemke (Merlin) appeared to be the quickest drivers on the track during the main event. Mike McAndrews (Fullerton) kept pace and Dakota Pesek (Top Kart) was able to hold on with the trio swapping for position lap after lap. Holden got pushed back to fourth with six laps remaining, leaving the three drivers to decide the top spot. Lemke led as they took the white flag, with McAndrews hot on his bumper. The two made contact in the back part of the track, allowing Pesek to slip past for the lead. After clinching the championship earlier in the day, Pesek notched his fifth victory of 2016. McAndrews crossed the line in second, but officials moved him behind Lemke in the results for the contact on the last lap. Holden finished fourth with Jake Venberg (Merlin) close early, placing fifth. 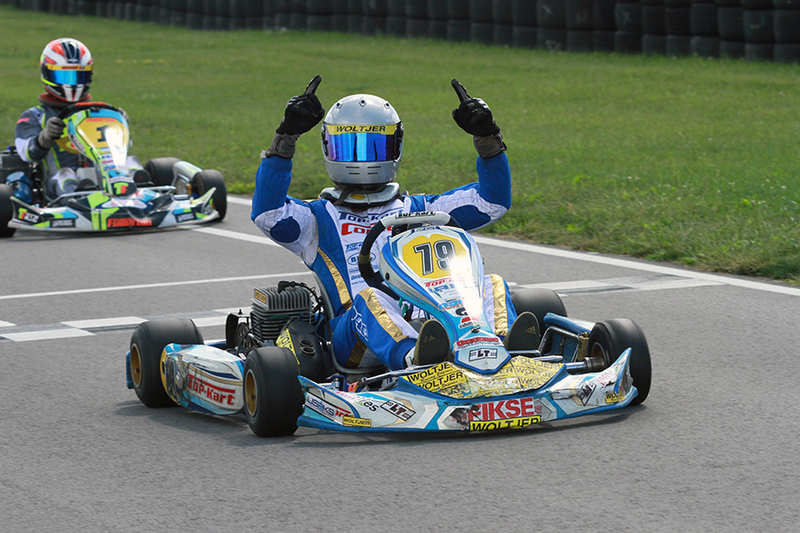 The Innovative Performance IAME Junior main event was a wide range of emotions. 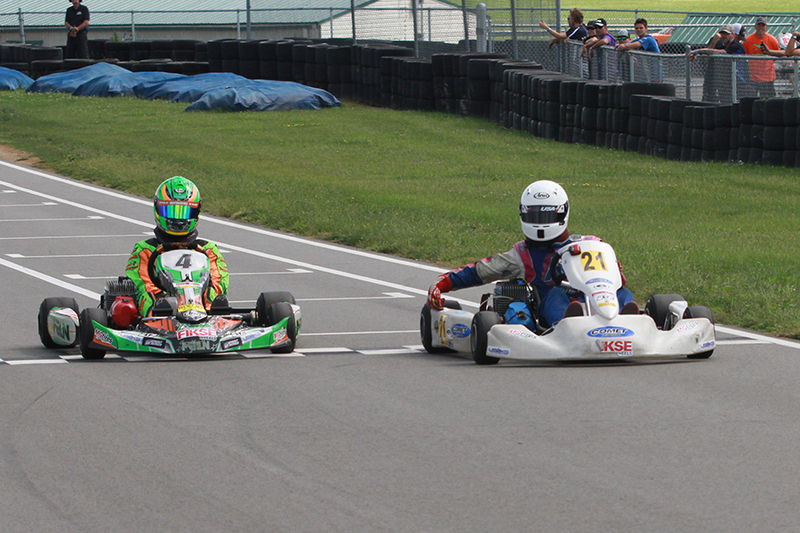 Myles Rowe (Tony Kart) set the pace on the day, topping qualifying and winning the Prefinal. Sam Mayer (Merlin) lined up outside row one, still holding on to a chance in the title chase after coming in underweight Saturday. Rowe entered the track for the main event late, and it was obvious that he was holding the airbox on the IAME engine. The field took the green flag and Rowe washed up the track through the opening corner. Mayer hugged the polesitter, and contact was made on the exit. Both dropped to the tail of the field with Mayer pulling off with a flat tire, and Rowe a few laps later unable to drive one-handed. The two met at the scales and shook hands, showing great sportsmanship, respect and heartbreak for one another. Meanwhile, point leader Alex Bertagnoli (Merlin) assumed the lead and led the first nine laps. Charging forward was Saturday winner Lance Fenderson (Tony Kart), knifing his way from the eighth starting spot. Both Fenderson and Austin Schaff (Merlin) worked by Bertagnoli, pulling away to make it a duel for the win. Schaff led as they took the white flag, with Fenderson able to capitalize on the final circuit, stealing the top spot and reaching the checkered flag for his second victory on the weekend. Schaff settled for second with Bertagnoli in the third spot, wrapping up the championship. Michael d’Orlando (BirelART) placed fourth, just ahead of Tahlon Yockel (Tony Kart). Heartbreak struck in the Woltjer Racing Engines Yamaha Junior division, once again for Mayer. Entering the main event, the Merlin driver remained the championship leader, looking for at least a top-five finish to secure the championship. A large lead pack shuffled back and forth, including Mayer until the halfway point when his muffler can broke loose from the engine, forcing him to pull off the course and losing the championship. That put it in the hands of Prefinal winner Alex Bertagnoli (Merlin), who positioned himself behind top qualifier Aidan Harrington (Kosmic). In the closing laps, Harrington kept Bertagnoli back, reaching the checkered flag first to secure his first victory as a Junior driver. The win was also special, carrying the #21 on his kart to honor former karter Andrew Palmer who remains hospitalized following a racing incident in May. Bertagnoli drove to second, securing his second championship of 2016. Austin Schaff (Merlin) completed the podium with Ben Varner (Merlin) moved to fourth after Elliot Budzinski (Tony Kart) was penalized one position for jumping the start. Just 30 points separated the top two drivers in the championship chase for Allison Racing Engines IAME Cadet. Four-time winner Reece Gold held the edge over Saturday winner and Benik teammate Tyler Maxson. The two started on the front row, with Gold holding the early advantage. Maxson took over the lead on lap six, with Gold helping to push the duo away from the field. With two laps remaining, Gold pulled the trigger to take over the lead with Maxson responding on the final lap. The Georgia driver slipped under Gold, and held off his teammate to reach the checkered flag first to complete the double win weekend. The second-place effort was enough for Gold to clinch the championship by just 10 points. 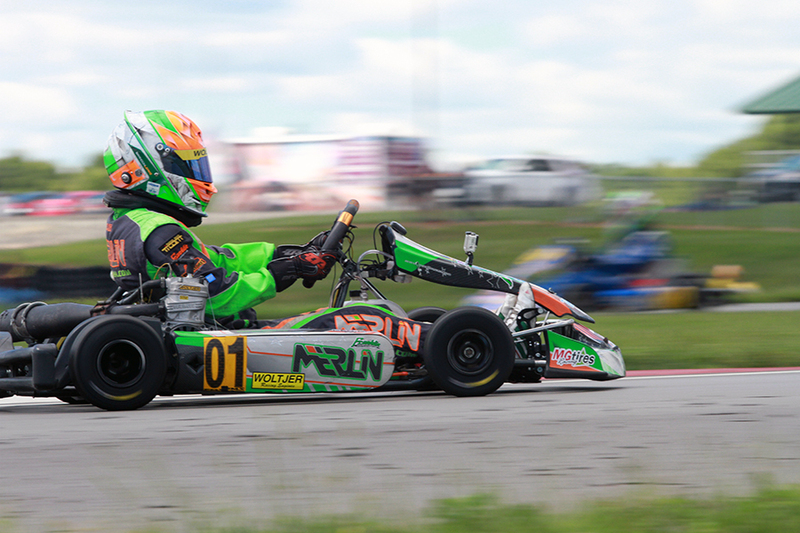 Kaden Wharff (Top Kart) duplicated his best result on the year, placing third once again on the weekend. Brent Crews (Energy), the 2016 IAME Rookie champion, jumped up to Cadet for Sunday’s action. After contact in the Prefinal dropped him to 14th, Crews showed great maturity to drive his way up to fourth in the 16-lap main event, holding off Elio Giovane (Benik) at the line. Kaden Wharff (Top Kart) completed a perfect weekend in the Switch Racing Engines Yamaha Cadet division. After sweeping Saturday’s round, Wharff doubled up with another perfect day Sunday to claim his sixth victory on the year. The disqualification and removal from the event in Mooresville cost him the championship, ending the standings in the second spot. Behind him on the track was Round Six winner Nicholas Terlecki (Merlin) taking his second top-three finish of the year over Annie Rhule (PCR), landing on the third step for her first trip to the podium. California driver Colin Queen (Tony Kart) ended up fourth ahead of Logan Adams (FA Kart). The championship went to Garrett Adams (FA Kart), who entered the weekend with the title and clinched it Sunday, placing seventh. Brent Crews clinched the Jay Howard’s MDD IAME Rookie championship on Saturday, and moved up to the Cadet class Sunday, opening the door for another driver to step up on the day. That driver was Mateo Rubio-Luengo (Kosmic). The Round Five victor drove away with the Prefinal win, and was able to lead 11 of the 12 laps in the main event. Paige Crawford (Tony Kart) put up a great battle, placing runner-up for the third time on the year. 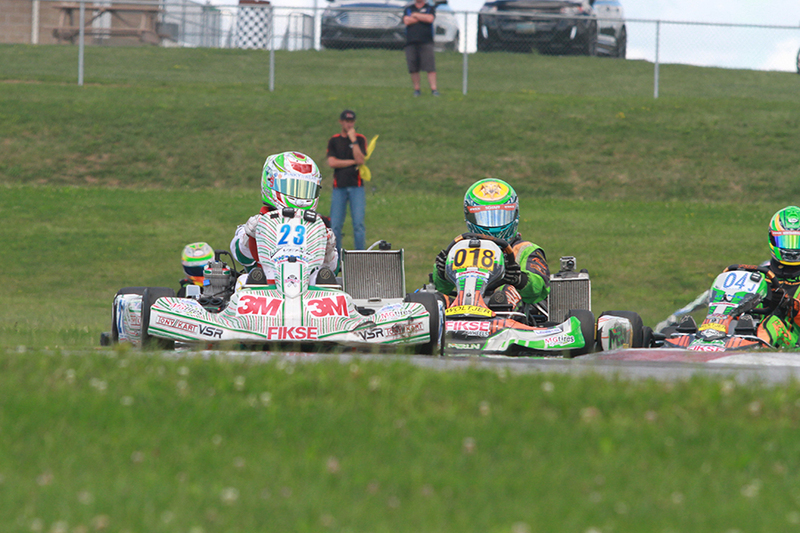 Frankie Iadevaia (FA Kart), Tanner Garvin (Benik) and Eli Trull (Vemme) rounded out the top-five. Elliot Cox (Benik) notched his third victory of the season in the QPS Employment Group Yamaha Rookie class. Paige Crawford (Tony Kart) set the pace in qualifying, with Mateo Rubio-Luengo (Kosmic) taking the top spot in the Prefinal. Cox drove to second, and planted himself on the bumper of Mateo to begin the main event. Lap five, Cox took over the lead and Rubio-Luengo looked for a way around. A spot never opened up, with Cox reaching the checkered flag first by 47 thousandths of a second over Mateo. 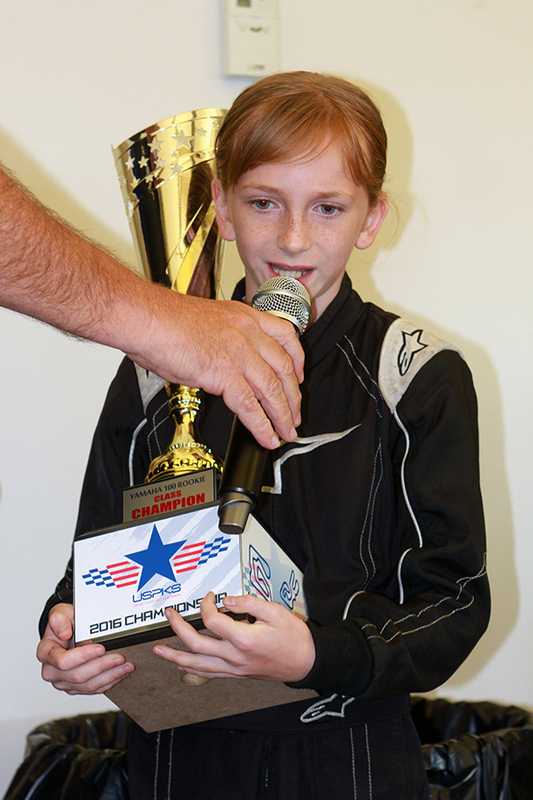 Eli Trull (Fullerton) was a close third with Crawford using her fourth place finish to earn the series champion, becoming the first female driver to earn a USPKS title in its four-year history. Danny Dyszelski (Vemme) rounded out the top-five on the track.